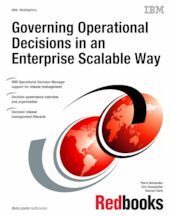 This IBM® Redbooks® publication presents decision governance topics from a theoretical discussion perspective and then goes on to make links to the practical aspects of applying these concepts by using the IBM Operational Decision Manager platform. This book explores enterprise governance context to clarify the bigger picture for how governance is carried out across the enterprise. You will also find this book valuable if you are using or considering the usage of an operational decision management system (or business rules management system (BRMS)) in your organization. You might be following a standard such as the The Open Group Architecture Framework (TOGAF) Architecture Development Method (ADM) and decided to use a decision management system that lets the business people take control of the business decisions that are made by the technology systems in their organization. This book also describes Control Objectives for Information and Related Technology (COBIT), which provides a comprehensive framework that assists enterprises in achieving their objectives for the governance and management of enterprise IT. Another topic of great importance that this book covers is the relationship to ITIL, a public framework that describes best practices in IT Service Management. Of the five stages of the ITIL lifecycle, this book focuses on the objectives and processes of the Service Transition stage.